Book your ultimate Christmas gift now! That ultimate Christmas gift just became possible. 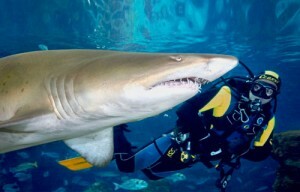 We’re taking bookings now for Shark Encounter and Junior Shark Encounter Dives on specific Christmas holiday dates. December 27th, 28th 29th and 30th are all ultimate dive days here at Blue Planet Aquarium, to dive with Europe’s largest collection of sharks! At just £175 for adults and £95 for junior encounters with full Scuba training included in the package. Call 0151 357 8804 now to book these dates, but hurry availability is limited, so it’s first come first served!